Demons? In Demon Hunters? What a novel idea! If you’re enjoying the comic, consider supporting it by becoming a patron on Patreon. Even a dollar a month helps us keep cranking out the comics, and goes toward unlocking more features on the site. Storytime with Kentucky Blue Clay, our first unlocked feature, premieres this Thursday–a monthly lesson on some of the weirdest cases in Brotherhood history. Meanwhile, the Purple Ninja’s crouched in the rafters, waiting for us to hit the $400 milestone to unlock his bi-weekly advice column. At least, I hope that’s why he’s there. There’s just two days left to get your pledge in for April and bask in the subsequent rewards! Silent Jim stares at Gabriel, frowning. SILENT JIM: Bull$#&@. You're Gabriel. Act like it. Gabriel hangs his head, chastened. GABRIEL: I'm sorry, Jim, but you're wasting your time. A lot's happened since you've been gone. Whatever I used to be...that's not me anymore. Jim puts a hand on Gabriel's shoulder. A ragged film of darkness begins to swirl in around the edges of the panel, enveloping them. Gabe looks up into Jim's face. He hasn't noticed the weirdness. SILENT JIM: Hrm...Fine. One last favor? Suddenly it's sunset in a run down industrial area. We're inside a courtyard formed by the three-sided shell of a mostly collapsed factory. Mounds of concrete rubble are strewn throughout the area. A large area at the center of the courtyard has been cleared of debris, and a giant summoning circle has been chalked on the cement floor. Beyond the bloodstained circle, a trio of demons appears to be feasting on the remains of the mystics who summoned them. Gabriel and Jim, along with the bus, have appeared just outside the circle, and tendrils of darkness still swirl around their feet. Flaming trashcans provide illumination to the scene. Holy Crap! This gets better every time. Love the art, btw. Can’t wait for next page! Ever since I discovered the first Gamers movie, I am a big fan of the DG universe (by the way: brilliant accent, Herr Doktor!) and I absolutely love the webcomic you are putting together. Can’t wait to see more. As a curious fan, I wondered: How long does it take a skilled artist to draw a page like that? And how long did it take to outline the story, since you did this first as far as I understood? If you can hold the quality at its current standard, I am convinced that you will have a continuously growing fanbase (and, hopefully, more and more patrons). We started working on the comic in April of 2011. 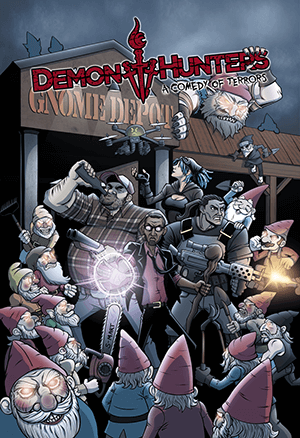 At the time, the plan was to adapt a script that Matt Vancil had written for a reboot of the original Demon Hunters as a webseries, but as we got to work on character bios and concept art, it became clear that there was so much more story to explore. Looking through my archives, the first actual script for the comic that I can find is a very different take on the first three pages, dated February 2nd, 2012. The first draft of the first issue was finished on May 7th, 2013. This doesn’t mean that it took fifteen months to write the first script–it just means that I’m a terrible procrastinator, and that video games are fun. It also doesn’t mean it’s finished. The most recent draft for the first issue is dated YESTERDAY. As far as we’re concerned, nothing’s permanent until it goes to print–you’ll definitely see some changes when these are eventually collected into graphic novels. Again, thanks for reading. Hope to keep doing you proud. Also, you’re a damn liar–Herr Doktor’s accent is atrocious. My justification is that he was rescued by the Brotherhood in 1944, and raised at the Academy, so it’s probably just an affectation. Dude’s a weirdo. Still love your comic! Keep up the good work! How long does it take a skilled artist? I couldn’t tell you. But I know how long it takes me, too long! Heh, all kidding aside it usually takes me a couple days to do a page, because I have to find the free time in between the day job and my unusually-talented-at-climbing toddler. As I get more comfortable with the schedule, I’m sure I’ll be able to crank them out in a few hours apiece. Someday. Thanks for your compliments! I hope I can keep my art standard up and continue to push it higher with every page. Love the flying-abomination-krang-thingy. Looking forward to seeing more monsters and demon. I agree, there’s a lot more I wish I would have done with the reveal. But I’ll probably add/touch up some stuff before the book goes to print, whenever that will be. I’m currently working on a close up of floaty-Krang, tune in on Tuesday! 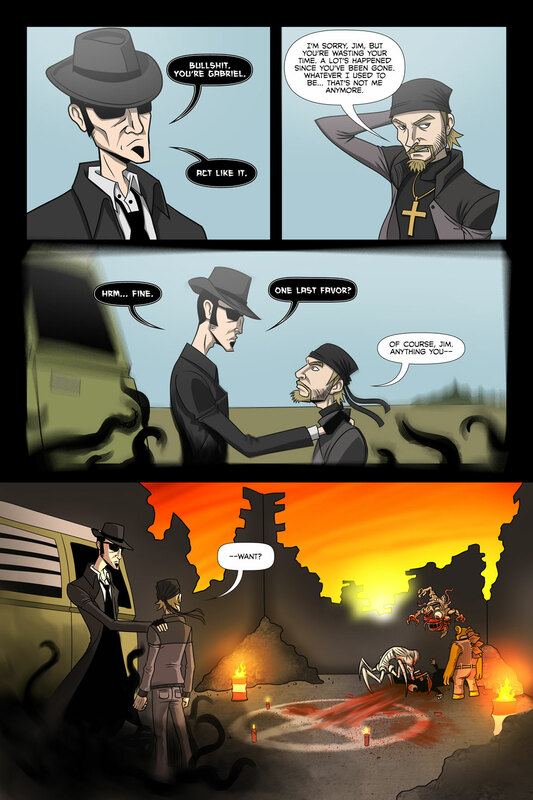 I think that Gabriel looks awesome on the second panel! I can’t really pin it down, but the human characters in this webcomics don’t look all that great in my opinion. Jim looks cool, but Gabriel hardly ever does. I can kind of see what you’re talking about. I think it has to do with how Jim has sharp features, and Gabriel has more rounded features that humanize him more(he also might be the only real human in the Brotherhood). You also can’t see Jims eyes, and eyes are really hard to get just right with this art style. It also probably helps that Silent Jim might be a dark tentacled horror from outside of time and space that is protecting humanity for reasons unknown. Silent Jim can also teleport people and things now in additional to instant sober powers? It’s like having Don at the table!